Brief description of Fred Kiel's book taken from the HBR website. Seems an interesting read. PUBLICATION DATE: April 07, 2015 PRODUCT #: 16899E-KND-ENG Does the character of our leaders matter? You may think this question was answered long ago. Countless business authors and analysts have assured us that great leadership demands great character. Time and again, we've seen that truth play out, as once-thriving organizations falter and fail under the guidance of leaders behaving badly. Why, then, do so many executives remain skeptical about the true value of leadership character? A winning strategy and a sound business model are what really matter, they argue; character is just the icing on the cake. What's been missing from this debate is hard evidence: data that shows not only that leadership character matters for organizational success, but how it matters; and concrete evidence that it leads to better business results. 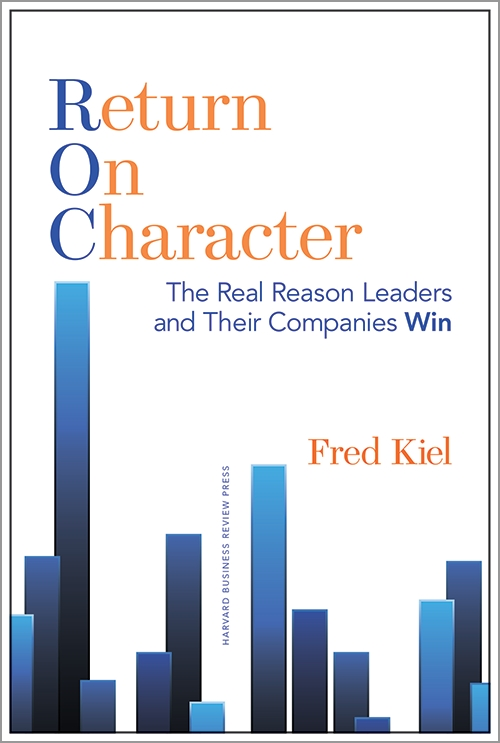 Now, in this groundbreaking book, respected leadership researcher, adviser, and author Fred Kiel offers that evidence-solid data that demonstrates the connection between character, leadership excellence, and organizational results. After seven years of rigorous research based on a landmark study of more than 100 CEOs and over 8,000 of their employees' observations, Kiel's findings show that leaders of strong character achieved up to five times the ROA for their organizations as did leaders of weak character. "Return on Character" goes on to reveal: How leadership character is formed, how it creates value, and how that value spreads throughout the organization; How low-character leaders undermine the success of even the best business plans; How leaders at any level can develop the habits of strong character and "unlearn" the habits of poor character. The book also provides step-by-step advice and techniques for assessing your own character habits and improving your performance and that of your organization. "Return on Character" provides the blueprint for building your own leadership character and creating a character-driven organization that achieves superior business results. You must be a Registered Member to post a comment, if you are an existing member, please login from above.